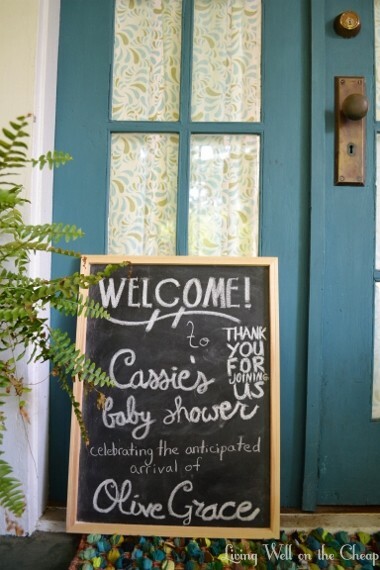 I’ve mentioned about a dozen times that I was hosting a baby shower for my friend Cassie at my house this weekend. It went so wonderfully and I can’t wait to share pictures and details tomorrow, but today I want to show you the last-minute decoration I made that can be repurposed to adorn the nursery. It all started with a $4 yard of burlap that I cut into triangles. I bought the whole yard because I knew I could use it for other projects but probably used less than half for this. Burlap is super forgiving so I didn’t have to worry about cutting them perfectly. Then I printed out my letters in 300 point Cambria font (there are prettier fonts out there for sure, but I needed something that would be easy to trace with paint). How beautiful is the name that Cassie and Nic have chosen for their daughter? I hope that Jack and Olive grow up to be friends. It was hard to resist the temptation to buy every bottle of pink paint Hobby Lobby had to offer. 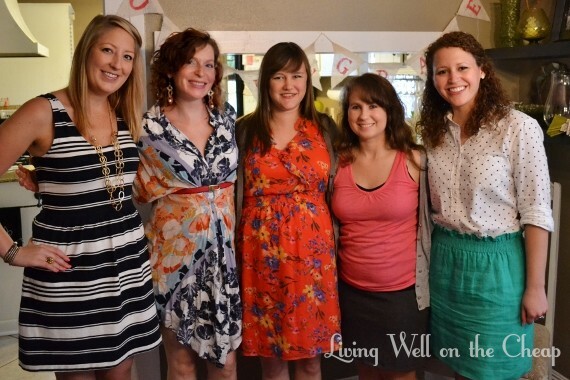 They were all so pretty! Even Jack was a fan–he yelled until I let him hold the bottle while we finished shopping. I laid the paper letters behind the burlap and used a stiff brush to apply the paint. It went more quickly than I thought it would and was actually a really relaxing activity to take on the day before the party. Jack was napping and Nick was still at work so it was just me and my paintbrush in a quiet house. After letting them dry for a little while, I peeled the paper off the backs, laid them out to get the spacing right, and then folded the top of each pennant over a length of cotton cord with a line of hot glue to secure. It’s the exact same technique I used for the banner I made for my sister’s wedding, except this time I didn’t get the letters mixed up! 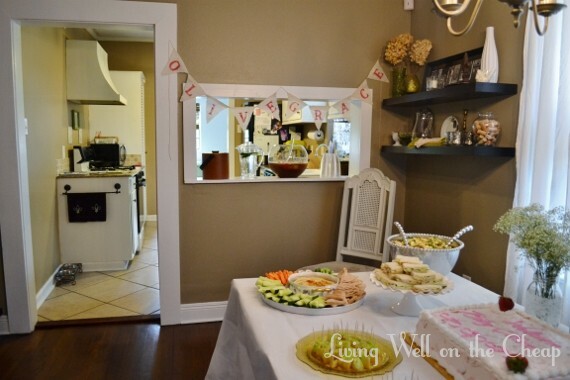 My original plan was to hang it in front of the dining room curtains behind the food table, but I couldn’t get it to look right and it’s just as well, because I actually LOVED the way it looked over the drinks station we set up in the kitchen pass-through. I just used white thumbtacks to secure it to the wall (they blended right into the wood trim, but I used a dab of taupe paint to camouflage the one stuck directly into sheetrock). My hope was that Cassie would like to bring it home to use in the nursery, but I didn’t mention it because I didn’t want her to feel pressured if it just didn’t jive with the look she was going for. Imagine my excitement when she said she wanted to hang it over the crib! Cassie is truly one of my oldest and dearest friends so I’m honored to have something I made on display in her daughter’s room. I am so so happy with the way everything with the shower came out and I can’t wait to post about it tomorrow! 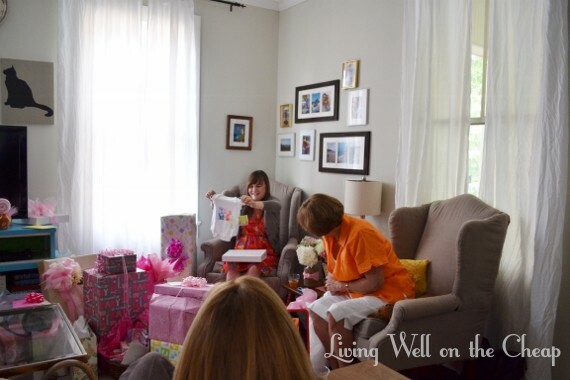 I hope you all had as lovely a weekend as I did–it’s not every weekend I host a fabulous party at my home AND celebrate my first Mother’s Day! 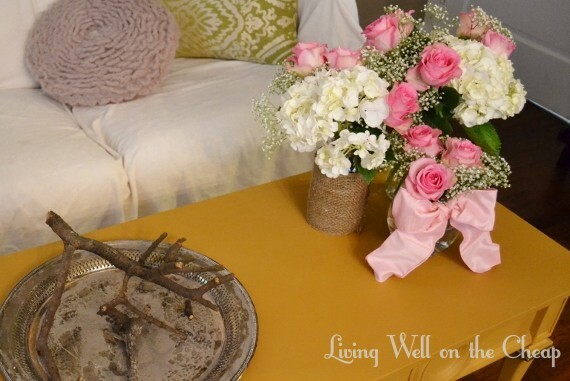 1) Focus on what the guests will see. 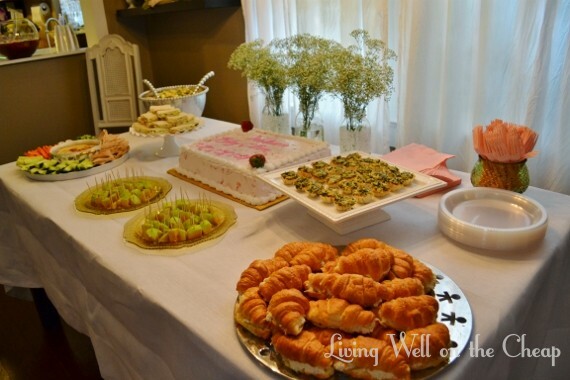 For this party, that means the living room, dining room, and downstairs bathroom. In those rooms I’ll dust, clean all the pet hair off the furniture, wash the curtains (again with the pet hair), and give the floors a good detailed vacuum. 2) Declutter. For the most part, an uncluttered space looks clean from afar and a cluttered space looks junky even if there’s not a speck of dust. So I’m gradually working through the entire downstairs to put things away and clear piles that may have accumulated. It’s especially important to focus on the entryway, since this is what folks see first. 3) Take your time. I am not one for marathon cleaning sessions spread over 1-2 days. My house was a wreck when we got back from Texas a few weeks ago and I’ve been gradually getting it back into shape little by little. 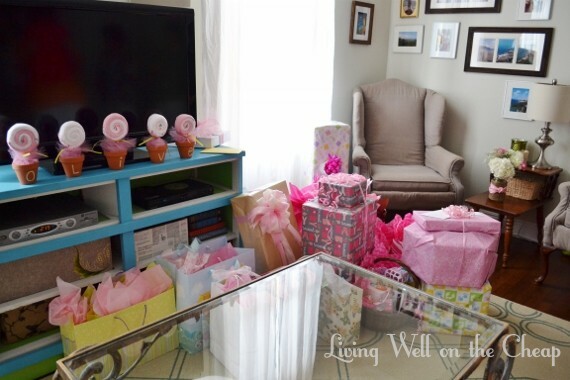 I’m cleaning for the party the same way–I already dusted and vacuumed under and behind the living room and dining room furniture, so the day before the party I can just do a quick pass again. I’ve got a big list written out of things I want to do and I’ll try to knock off a couple each week. 4) Wipe smudges. This one is a biggie in our house for some reason. Smudges of dirt on doors, stair railings, and light switches look really bad, but they’re super easy to clean. It’s so satisfying to go around the house with a magic eraser and have all those spots we touch every day looking good again in no time (I already did this too). 5) Bring in reinforcements. I haaaaate cleaning bathrooms. Hate hate hate it. And the truth is that I am just not detail-oriented enough to do a really good job. I’m thinking of bringing in a cleaning lady just to tackle the bathrooms. This is more cost-effective than hiring someone to clean the whole house, especially since the lady I have in mind charges by the hour. I could get two hours’ worth of cleaning for about $30. My entire house will definitely not be spotless for the shower, but it’ll at least look good enough that I’m not embarrassed. And the truth is that I enjoy living in a clean house! We deserve to have a home that’s clean and comfortable. If I could afford it I’d totally hire a cleaning lady to come every week (and someone to mow the lawn, too) so we could spend less time maintaining our home and more time enjoying it, but even without help I can keep my home looking nice by just doing a little bit every day (and maybe shutting the door to a room or two). I love the idea of cupcakes. It’s good portion control for tummies big and small and Jack can have one of his very own without requiring a dedicated “smash cake.” My sister is an excellent baker and agreed to try her hand at this healthier recipe (bonus: it looks delicious!). I’m really not into anything “themed,” so I think I’ll stick to simple decor. If I can get myself organized enough to order prints I’d love to have a bunch of photos clipped to a clothesline showing Jack from in utero to today. I will definitely take advantage of this free printable to add a little flair to the cupcake of honor, especially since it ties into the colors I’m liking (blue, yellow, and green, the same colors I used in Jack’s nursery and in more muted shades throughout the rest of the house). And I could totally try my hand at some pretty lettering on a chalkboard to memorialize some of Jack’s stats (or outsource it to my friend Cassie, who is really good at that sort of thing). 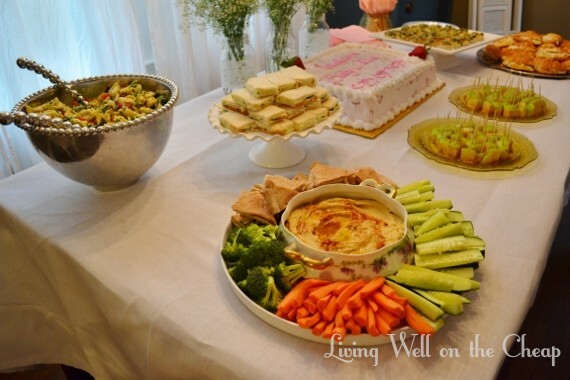 As for food, I’m thinking simple summer fare like sandwiches, potato salad, hummus, guacamole, fruit kabobs, and a cheese tray. We’ll probably just invite immediate family and close friends, and celebrate with extended family a week later when we see them for the Fourth of July. Happy Friday, y’all! It’s a beautiful day in Baton Rouge and Jack and I are planning on making the most of it! I hope you do too!